If you have been injured in a car accident, you should consult with a personal injury lawyer in order to fully understand your options, and ensure that your rights are protected. At Curran Law Firm in Windsor, we can help you make decisions about what to do following your car accident. Insurance companies will often offer settlements at a fraction of what you are entitled to. Lawyer Peter Curran spent many years working for insurance companies giving him an inside perspective on the tactics used by these companies to minimize or avoid paying claims. At Curran Law Firm, we are prepared to fight for your rights and take your case all the way to trial if necessary. We have many years of experience in analyzing the factors of each case in order to determine the appropriate course of action for you. As a society, we have become addicted to our smartphones. It can be hard to fight the urge to check your phone every few minutes, but when you are behind the wheel you have a responsibility to pay attention to the road. Taking your eyes off the road for even a few seconds to send or check a text message can lead to horrific and entirely preventable accidents. Please Do Not Text And Drive. 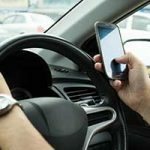 Ontario Provincial Police say distracted drivers were behind more fatal collisions in Ontario last year than any other. If you have been injured in a motor vehicle accident caused by texting and driving or distracted driving, please contact us today. At Curran Law Firm, we provide our clients with the information required to make informed decisions about their injury claim. Experienced personal injury lawyer Peter Curran will meet with you in person to go over the details of your motor vehicle accident claim. We operate on a contingency fee basis, which means that we do not charge an initial retainer to start working on your claim. We only get paid when your case is successfully settled or there is an award from a trial. Serving Windsor, Leamington, Sarnia, Huron County and Bruce County. Contact us by telephone at 1-888-882-8121 or ask us to contact you.